Iranians pose for a picture as they assemble with others in the capital Tehran's Azadi (Freedom) square on Feb. 11, 2019, during a ceremony celebrating the 40th anniversary of Islamic Revolution. 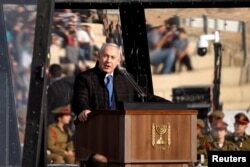 State television showed crowds defying cold rainy weather and carrying Iranian flags while shouting "Death to Israel, Death to America" — trademark chants of the revolution. Prices of basic foodstuffs have soared since President Donald Trump withdrew Washington from world powers' 2015 nuclear deal with Iran last year and reimposed sanctions on Tehran. 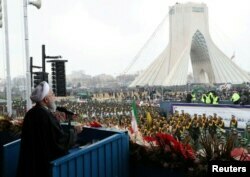 "I bow in admiration to Iran's resilient people who — despite hardships and grievances — today poured into streets by the millions to mark 40th anniversary of their Islamic Revolution, which some in the US wished would never come," Iranian Foreign Minister Mohammad Javad Zarif tweeted.